Clove Hill Manor is a 55+ community located in Wantage, New Jersey. This active adult neighborhood consists of 117 single-family and attached homes that were developed between 2003 and 2007. With an on-site clubhouse and friendly neighbors, residents of Clove Hill Manor will never have a dull moment. Clove Hill Manor is also conveniently located next to everyday conveniences, while New York City and Bethlehem, PA are just a short drive away, making this 55+ neighborhood a great place to call home. At the center of the community is the clubhouse. Residents can stay fit in the exercise room. A catering kitchen is also available for making snacks for events in the clubhouse's meeting room. The terrific amenities continue outdoors. A pool and patio are on hand for enjoying the warmer months. Start a weekly tennis routine on the court or join a leisurely game on the bocce ball court. Parks and natural space give Clove Hill Manor a scenic quality that homeowners love. Clove Hill Manor was developed between 2003 and 2007 and has 117 homes. There are two attached home models and they offer 2,105 or 2,391 square feet with two or three bedrooms, two-and-a-half or three bathrooms, and an attached one-car garage. The attached homes offer open floor plans, ample storage space, outdoor patios, and large, welcoming foyers. The single-family homes within Clove Hill Manor come in three models that range in size from 1,668 to 2,204 square feet and have two or four bedrooms, two or three bathrooms, and an attached two-car garage. These beautiful homes boast hardwood floors, twelve-foot ceilings, crown molding, and walk-in closets. 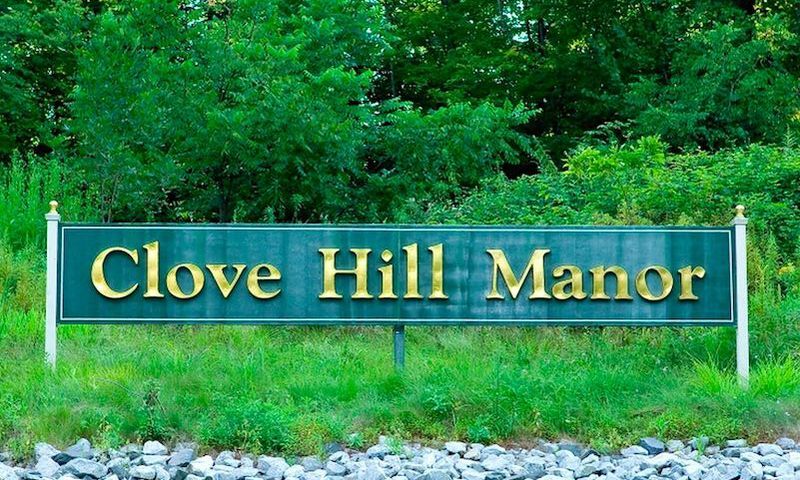 Homeowners love living in Clove Hill Manor because they can enjoy the company of like-minded neighbors. With the on-site amenities, residents can enjoy a competitive game of tennis or bocce ball. They can also relax poolside during the warmer months, join a group in the meeting room, or start an exercise routine. There will always be something to do in Clove Hill Manor. Thanks to the homeowners' association fee that covers water, sewer, exterior maintenance, and snow and trash removal, everyone within Clove Hill Manor enjoys a low-maintenance lifestyle. Clove Hill Manor is located in Sussex County, New Jersey. Homeowners are around the corner from a bank and down the street from restaurants, retail stores, and the Wantage Shopping Plaza. Clove Hill Manor is conveniently just off of Highway 23, making travel in the area a breeze, while Interstate 84 is just twelve miles away. Lehigh Valley International Airport is approximately 66 miles away. This 55+ community is near several recreational opportunities in Sussex County, including Wallkill National Wildlife Refuge, High Point State Park, and Wawayanda State Park. The area also hosts a winery, stables, and a water park for when the grandkids come to visit. Clove Hill Manor is along the New York/New Jersey border, giving residents proximity to upstate New York and downtown Manhattan. For an active adult community close to urban excitement yet located in a low-key environment, look no further than Clove Hill Manor in Northern New Jersey. There are plenty of activities available in Clove Hill Manor. Here is a sample of some of the clubs, activities and classes offered here. 55places.com is not affiliated with the developer(s) or homeowners association of Clove Hill Manor. The information you submit is distributed to a 55places.com Partner Agent, who is a licensed real estate agent. The information regarding Clove Hill Manor has not been verified or approved by the developer or homeowners association. Please verify all information prior to purchasing. 55places.com is not responsible for any errors regarding the information displayed on this website.